This holiday season, you can see ol’ Saint Nick dive into the deep and swim with the fishies at an aquarium near you. We’ve hand-picked a few locations around North America, but he may be making additional appearances, so contact an aquarium in your area to see if they are expecting Scuba Santa this Yuletide! If you live in North Georgia, consider driving to Atlanta to see Scuba Claus at the Georgia Aquarium. Kids can catch a glimpse of Scuba Claus plunging into the largest aquatic habitat in the world during the 12:00pm and 12:30pm dive shows, Thursday through Sunday from now until Christmas. Hang around for a chance to talk to Scuba Claus on the “dry side” in the Ocean Voyager Theater. 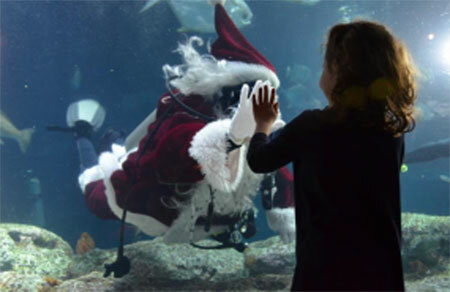 Scuba Santa will be enchanting folks who visit the Newport Aquarium this month. 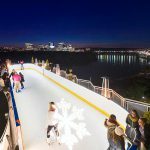 Whether you live in Newport or across the river in Cincinnati, plan a family trip to see Scuba Santa. The undersea festivities include Scuba Santa’s magic bubbles, dancing lights, and cheery holiday music. After Scuba Santa’s swim, children will have a chance to meet him in person and tell the big guy their Christmas wish. Enjoy this magical experience daily from 11am–4pm (except on 12/25). Scuba Claus will be taking a plunge into the Great Ocean Tank at the South Carolina Aquarium on select dates this month. He’ll be there from 11:00am–3:00pm on December 12–13 and 19–23, so plan a visit to watch him swim with the sea creatures. You might even see whether his belly jiggles like jelly underwater! 😉 There will be lots of other fun family activities, too; contact the aquarium for more details. Scuba Claus is visiting the Vancouver Aquarium every day until December 24th. He’ll be swimming through the Straight of Georgia exhibit, so you might see him swimming with belugas, halibut, sturgeon, or starfish. There’s also a possibility he will plunge into other galleries, so keep your peepers open as you stroll through the aquarium! 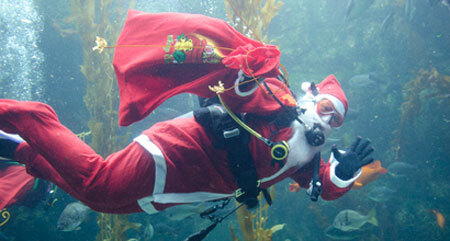 Scuba Claus will be diving daily now until December 24th. 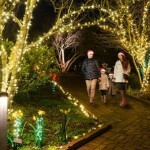 Check the Vancouver Aquarium’s schedule for more information to plan your visit. Scuba Claus wants to visit as many places as possible, so after the jump, you’ll find info on a handful of other aquarium appearances he’s making this holiday season. *Get reduced admission when you donate to a local non-profit organization.